It all started in 1971 for Jollyes, a single store was opened in Enfield which would see it grow into one of the largest chains of pet food superstores in the UK. To date there 61 Jollyes stores located around England and Northern Ireland. Jollyes primarily supply your pet with food, toys and accessories. These are the three core elements to the success of Jollyes and it is on these items you will find fantastic value with over 40 years of experience. 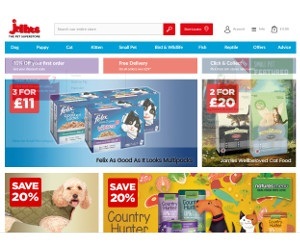 In terms of focus, Jollyes has a wide range of pet category that they cater for, there main ones are Dogs, Cats, Puppies, Kittens, Fish, Small Pets, Birds and reptiles. From time to time Jollyes will provide vouchers codes and discounts to new and existing customers. Be sure to check back regularly for updated codes. Spotted a code not on here? Email our team and they will swiftly add it for other users to enjoy. A leader in pet food and pet accessories, Jollyes is world renown for quality food to feed your pets, keeping them happy all year around. Check the offers and discounts to the right for the latest Jollyes savings available.